Meet Delia Johnson, a rider from Burke, who kindly spent a few minutes with FABB to talk about bicycling on Bike to Work Day 2018. Delia rides her bike regularly to get around the county. 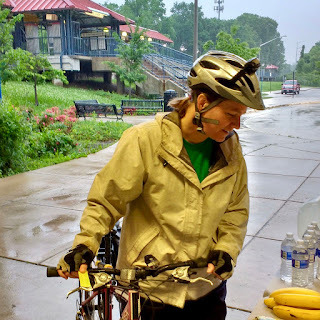 She commutes to her job at George Mason University and uses her bike for trips to the store and her local library. For her, the exercise is great but she also appreciates saving money that might otherwise be spent on gas and parking. In response to our question about what she most likes about riding, Delia told us that she likes the exercise and health benefits along with the feeling that she is doing her part for the environment and congestion by taking one car off the road. She would love to see a bike lane on Braddock Road to make is easier and safer to ride around Burke. FABB has been supportive of the efforts of Braddock District Supervisor John Cook and members of the Burke community to develop pedestrian and bicycle improvements for the Braddock Road corridor between Guinea Road and I-495. As briefly discussed at a public meeting on proposed pedestrian bridges last month, the plan now includes a shared use path on both sides of Braddock Road. Not a bike lane, but a clear improvement in a heavily trafficked area.